My goddaughters, Kylinn and Ellia, both have a connective tissue disorder called Ehlers-Danlos Syndrome (EDS). People with EDS have faulty or reduced amounts of collagen, which is the protein that adds elasticity and strength to skin, muscles and tendons, ligaments, organs, blood vessels, eyes, gums and more. Without ample collagen, joints dislocate frequently, skin tears easily and heals slowly, and pain is frequent or even continuous. Kylinn was officially diagnosed at 6 and Ellia at 3, though all the symptoms have been there since birth. Kylinn in particular has had many injuries resulting in casts over the years. You can see a picture of her at 15 months trick-or-treating with Trevor with a green cast peeking out from her Winnie the Pooh costume. 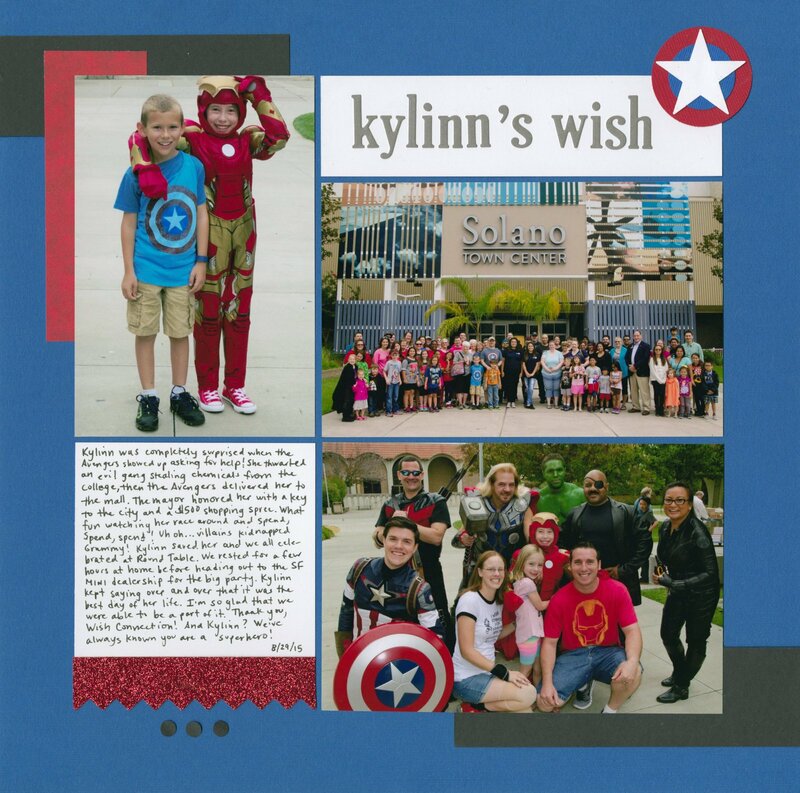 Last year, Kylinn and Ellia were each interviewed by The Wish Connection, an organization affiliated with AT&T that grants wishes to children who have chronically-debilitating medical conditions. After the interview, the wish-granting teams got to work. On the morning of August 29, we joined Kylinn's friends, family, and all the Avengers (except Iron Man) in gathering outside the front door of her house. We watched Kylinn accept the Avengers' request that she fill in for Iron Man and help them fight crime. She got into costume and headed across town to thwart an evil gang, received accolades and a key to the city from the mayor, had a shopping spree at the mall, rescued her grandma from yet another group of evildoers, had a celebratory lunch, and we all went to a giant party at the MINI dealership in San Francisco. The wish actually continued (for just the immediate family) for three more days, with visits and behind-the-scenes tours at San Francisco museums, a Giants game, and more. It was literally a dream-come-true for Kylinn. I've never seen her so happy. She kept saying over and over that it was the best day of her life. I'm so glad we were able to share the day with her. It was a great day and I'm glad to finally have it in the scrapbook. Ellia received her wish about a month after Kylinn's. She traveled to San Diego for a whirlwind of activities, including swimming with dolphins. She did have a party once they returned home, but unfortunately we were out of town and weren't able to be there. May is Ehlers-Danlos Syndrome Awareness Month. Through awareness, there is knowledge. Through knowledge, there is power. Oh, that's awesome! Terrific page documenting the day! A very special, touching, and absolutely wonderful scrapbook page and blog post!